Back in 1906, when Las Vegas was just a dusty crossroads in the middle of the Nevada territory, a tiny hotel for travelers through the area opened at the corner of Main and Fremont. The Hotel Nevada, as it was called then, gave a respite and landing space for those coming through and in need of a place to rest for the night. But innovations were happening from the beginning, with the hotel receiving Las Vegas’s first telephone number, 1, in 1907. In the time since then, the hotel has gone through owners, modifications, and changes that have altered the outward appearance, but never changed the real spirit of the place. And with the purchase of the hotel, which is now known as the Golden Gate, by a partnership between Derek and Greg Stevens and Mark Brandenburg in 2008, the Gate as it’s affectionately known by its loyal patrons set out on a course to mix old and new aspects of the Vegas experience. Later, taking a higher stake in the property and becoming CEO of the property, Derek Stevens, who has been dramatically shifting the way people look at and approach downtown Las Vegas, took the Gate through a complete renovation and addition of a 5 story expansion giving the hotel 14 new suites and high roller penthouses. With the modifications complete, the Golden Gate has become one of the most unique properties downtown. And I have the fortune to share with you, our readers, just what can happen when a creative renovation of a historic hotel is done with the right amount of care and respect to the past. For my 36th, I decided that I would be doing the downtown Las Vegas thing yet again, having tired of the strip and enjoying the idea of easy movement between hotels as well as lower limits and better odds for the player. Therefore it was a no brainer to book one of the new Golden Gate Suites. Book rates on a weekend night are $199, a bit high for downtown, but well worth it for the ease of access and amenities that you get with your stay. Also of note, if you build a relationship with a host of the players club, the rates can go significantly lower, which was the case for my stay. From valet parking to check in, a total of maybe 50 steps, you are quickly checked in and given your keys, and sent another 20 steps to the elevator. I was quickly off on the fourth floor and ready to go. Just off the elevator, you are steps from each of the 6 suites on the floor as you enter in the new wing. The look is clean and modern, with touches of crystal and red carpeting. Down the hall to room 46 I go, my room number adorned with a black and white historical picture, harking to the history of the property itself. Insert key card and in we go. Immediately inside it becomes apparent that the suites are large, airy and open plan with a high ceiling and tons of natural light during the day. There are four distinct areas of the suite beyond the entry, which contains overall light switches, a (sadly) motion based thermostat, and a large full height mirror for last minute checks on the way out of the suite for the night. The first thing you notice is the long, linear piece of cabinetry that follows the interior wall of the suite. We will get into more detail on this later, but it is laid out with thoughts to the suite itself and how it’s organized, and features some great offset lighting proving a great anchor to the layout of the space. To the other side of the room, you first encounter a large seating area with an L shaped leather couch and ottoman and large barrel floor lamp set against a bright red wall. Each of the suites is adorned with pictures of an iconic Vegas show-person, and in my case, suite 46 was full of pictures of Sinatra in his prime including a large hanging print behind the couch. To give a touch of mood, the lamp is dimmable, and additionally there are pillows on the couch giving it more of a home feel and less your standard hotel fare. A perfect place to relax with a cocktail before heading out. Directly behind the seating area and adjacent to the entry is the most interesting aspect of the suite design, the bathroom. Designed to be totally open plan, it features a long multi-use counter with storage underneath. At the end, there’s a few extra benefits for guest’s enjoyment. Each suite has its own Keurig machine with a selection of coffee and cups for use as desired. Also included are an ice bucket as well as bottles of Fiji, although I am unclear on if these come with the suite or are an extra charge as it’s not laid out clearly to the guest. At the far end of the bar is a wall dividing the area from the entry, with a full height mirror above the counter as well as hanging pendant lights. The sink is laid out with the faucet to the side, and water ranges from cold to blisteringly hot quickly. Always a benefit. There’s also a make up mirror with lighting for use in getting ready for the evening. Another thoughtful touch and nod to the clientele these suites hope to attract, the amenities and products for the room come with super soft and plentiful white towels as well as bath products by L’Occitane. There’s also an outlet handy for anything you’d need to plug in, as well as the hair dryer provided. To the back of the bath area is an enclosed water closet, separated with by a frosted glass door. Thankfully there is a fan that runs with the light for the WC, providing a bit more privacy for those concerned about the open layout of the bath area. Just to the side of the WC is a walk in shower, enclosed behind the same frosted glass door. A towel hook right outside the door is thoughtfully placed. Inside, the shower, clad in brown striated tile, is roomy and wide, with a high ceiling and shelf for bath products as well as a ledge for propping up your legs for shaving or cleaning. The shower itself includes both a deluge rain style head and a hand mounted massaging wand providing ample pressure for a wonderful, spa-like shower experience. One note, the light for the shower is located on the wall outside of it behind the curtain on it. Not the easiest to find, but not a terrible burden either. So how does one have any privacy in a bathroom like this? You answer is shown below. A floor to ceiling curtain can be drawn around the entire bath area all the way to the rear entry, allowing the space to be contained and privatized as needed. It’s not sound proof by any means, but it’s a great creative solution to keeping the plan open but allowing privacy when needed, another testament to the thought that went into the suites when they were conceived. Returning back to the living area, we pick up where we started earlier in talking about the huge, built in cabinetry along the wall of the suite. At the end closest to the entrance is a cabinet containing one of the best benefits to any suite, a refrigerator for guest use. 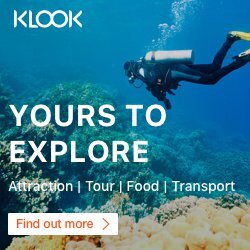 There is no mini bar here, however there are plenty of ways to keep your own food and drink cold as you wish for likely half the cost of a typical mini-bar’s selection. Next to that are several drawers for storage, and above the top of the drawers and cabinets is a large flat plane to set down items as you wish, and the top of the unit holds a large plasma TV with plenty of options for television watching and a great build in sound system. Note: you can actually access the HDMI port for the TV, allowing you to hook up things you want if you, like me, travel with those accessories. It’s not an advertised feature, but if you’re careful and polite in its use, there is no reason not to take advantage of it. Just past the TV is a desk area, featuring a red plush chair with chrome accents and an art glass lamp in the same cream, red and brown tones of the room itself. Nearby is the light to the ambient lighting above the unit, as well as extra shelving storage, and plugs for your laptop or whatever device you may need to use. If you have to work in Vegas, the Gate has you covered. At the far end of the unit is a tall double doored cabinet. Inside you’ll find extra pillows, a safe, ironing board. There’s also a luggage rack if you need a bit more storage outside of what’s already offered. Next to the closet, by the window, is a chair and table, with a window on the wall behind. It’s a perfect place to sit down for putting on shoes and socks, or doing final checks on clothing before you head out for the night as well. Additionally it makes a great place to kick back with a book if you’re in the mood for a bit of a slower day. The most important thing about any room though is the bed. The beautiful design of the Gate’s suites, with their color palette and choice of aesthetic, is only heightened by the bed and area around it, which is unique and designed with the guest in mind. The bed is set in an alcove, divided from the living area by a large open patterned chrome divider, a modern touch. On the left nightstand, we find a phone and an outlet, as well as controls for the overhead reading light and a bedside lamp as well as one drawer. On the right, the setup is much the same with an outlet perfect for charging devices, as well as an iHome type alarm clock for your devices if they have the right connector type for use with it. But most importantly is the bed, which is minimally clad in crisp white linens with soft pillows as well as decorative pillows in red and gold. The bed is a perfect mix of firm and soft, and although I found the linens to be a bit too warm (which could be a result of lack of movement in the room making the sensor-based AC turn off) my sleep was wonderful and relaxing, the perfect retreat after a night of debauchery on Fremont Street. What perhaps, at the end of the day, will continue to make the Golden Gate as popular as it has become is the kind of attention to detail that owners Derek and Greg Stevens are putting into bringing the Strip style of amenities downtown into an affordable package that will lure even those who prefer rooms at the mega resorts down to a place where they can get a reasonable suite and have a hell of a good time seeing the wonder and crazy that is Fremont. Toss in perfect cohesive design, high limit gaming with wonderful service, a spirited atmosphere, and just the right amount of history and the Gate and it’s suites become the perfect place for the luxury traveler to try out something new and exciting. I’ve become a convert, and I couldn’t be happier. So if you’re in Vegas and want to try something new, give the Gate’s suites a try. I don’t think you’ll be disappointed. 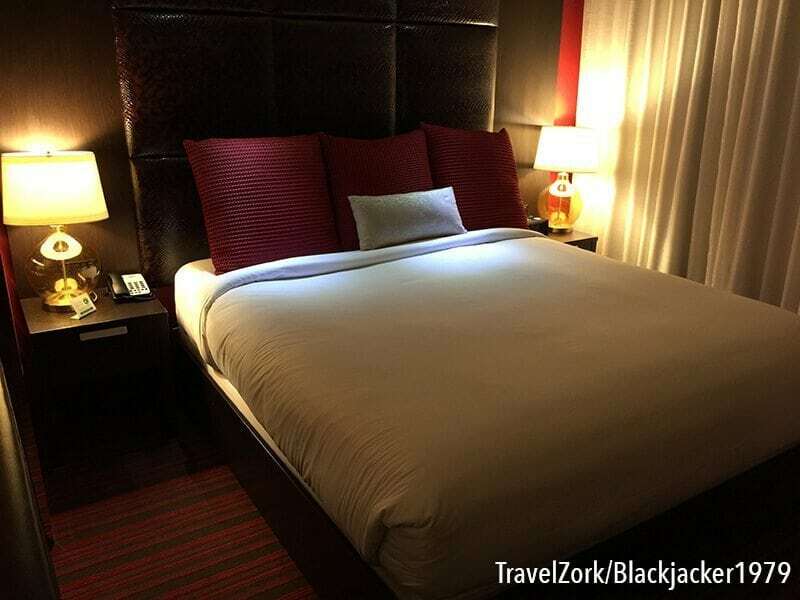 Be sure to explore other great casino hotel reviews on TravelZork.